But everything changes when Evie’s forced to pose as her glamorous boss for one night, and her darkest secret comes out: she has powers, too. Now it’s up to her to contend with murderous cupcakes, nosy gossip bloggers, and supernatural karaoke battles—all while juggling unexpected romance and Aveda’s increasingly outrageous demands. And when a larger threat emerges, Evie must finally take charge and become a superheroine in her own right...or see her city fall to a full-on demonic invasion. 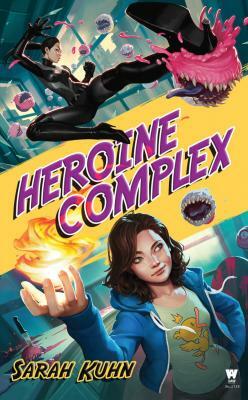 Sarah Kuhn is the author of the Heroine Complex series—starring Asian American superheroines—for DAW Books. She also wrote The Ruby Equation for the comics anthology Fresh Romance and the romantic comedy novella One Con Glory, which earned praise from io9 and USA Today and is in development as a feature film. Her articles and essays on such topics as geek girl culture, comic book continuity, and Sailor Moon cosplay have appeared in Uncanny Magazine, Apex Magazine, AngryAsianMan.com, IGN.com, Back Stage, The Hollywood Reporter, StarTrek.com, Creative Screenwriting, and the Hugo-nominated anthology Chicks Dig Comics. In 2011, she was selected as a finalist for the CAPE (Coalition of Asian Pacifics in Entertainment) New Writers Award. You can visit her at heroinecomplex.com or on Twitter: @sarahkuhn.